Using a rice cooker to make quinoa is a game-changer- it’s such an easy way to make this healthy food and have it ready for delicious meals like Mexican Quinoa Stuffed Peppers, Jarred Quinoa Salad with Spinach & Tomatoes, Caprese Quinoa & Meatball Casserole, Greek Quinoa Salad, Pizza Quinoa Mushrooms, or Quinoa-Berry Breakfast Bowls! Originally published in 2012, this remains one of our most-pinned and searched recipes. I have discovered a new favorite food and it happens to be healthy for me too! Quinoa is a delicious protein-filled side or main dish that is as just as easy as rice to prepare. Today I want to show you how to make quinoa in your rice cooker. You won’t believe how easy it is to make rice cooker quinoa and the best part is that you can make a weekly batch and enjoy it all week long to add or create other dishes with. Thanks to a little site called Pinterest, quinoa is quickly becoming one of the hottest foods this year to try to create new recipes with. Quinoa, pronounced (KEEN-wah) is a very nutritious gluten-free seed that originates from the Andean region of South America. There are so many surprising benefits of quinoa. Quinoa, for example, is a fantastic source of protein, contains all eight amino acids, is a good source of dietary fiber, contains B Vitamins, and iron. Though it is smaller than rice, barley, farro and bulgur, quinoa looks like a grain, thanks to its neutral coloring and hard exterior. In reality, it is actually a seed that originates from the cousin of the spinach plant. When cooked, these seeds expand rapidly and significantly, become tender but chewy and expel spirals that boast the slightest crunch. After cooking quinoa in a liquid of your choice (water, chicken broth, or vegetable broth), it becomes light, fluffy, and nutty. I find the flavor of quinoa to taste a little like couscous and a little like brown rice. It is one of those grains that is difficult to describe, but worth trying simply for the nutritional benefits it offers. I Don’t Have a Rice Cooker. How Do I Cook Quinoa on the Stovetop? Honestly, it is one of those kitchen appliances that is worth its weight in gold, but you can still prepare quinoa easily on your stovetop too. To cook quinoa on the stove, measure two cups of liquid per cup of quinoa and combine them in a saucepan. Bring the mixture to a vigorous boil, then lower the heat and simmer, covered until the quinoa is tender, but still chewy and white spiral-like threads appear around each grain. This should take approximately fifteen minutes. What Rice Cooker Do You Recommend? A year ago I bought this inexpensive rice cooker for about $20 and I have been using it two to three times a week ever since. It provides consistently great brown rice, white rice, steamed vegetables, and quinoa for our family with very little work on my part. I consider it a meal prep must-have for your home especially since everything can be prepared in under 30 minutes. I also love that the inexpensive versions don’t require a lot or programming or the use of a special rice setting. You simply turn it on, and it does its own thing. It does take up valuable space in my kitchen, but it has earned its rights to the space by saving me a lot of time hovering over pots! I don’t really love quinoa plain, but I think it is a great building block for creating healthy dishes. For example, my favorite dish right now is to simply add the zest from one lemon to the cooking liquid (in the recipe I have shown you below). Then I chop a few handfuls of baby spinach and a pint of cherry tomatoes (halved) and place them in a large serving bowl. 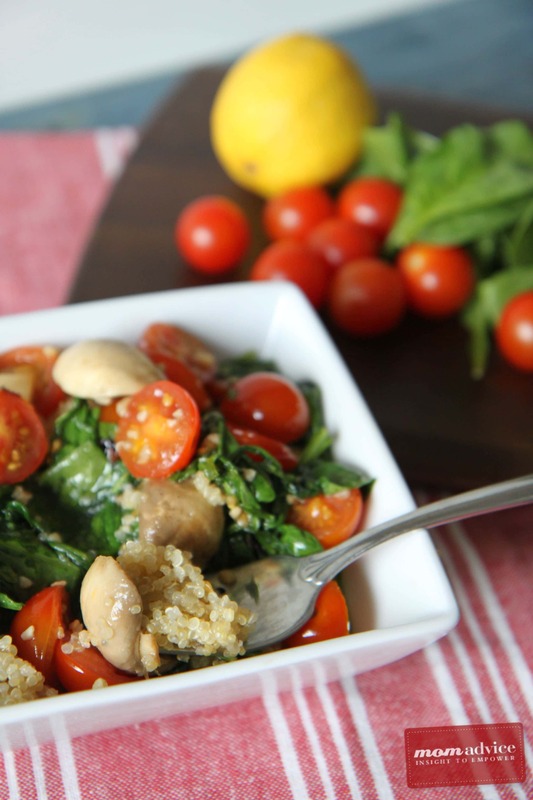 Cook the quinoa as directed and then put the hot quinoa on top of the spinach and tomatoes and allow it to wilt the spinach and cook the tomatoes with its heat for about five minutes. Then toss it all with the juice from one lemon and a little drizzle of olive oil. You can serve the salad warm or cold and I have found it to be a hit at every party I have ever taken it. Other ingredients you can add are sauteed mushrooms, sun-dried tomatoes, roasted red peppers, or white beans for a double whammy of protein power. Be creative with what you have leftover in your fridge, and put together your own flavorful combination. Quinoa in the rice cooker is easy as 1,2,3. This is a simple and fool-proof way to make delicious quinoa that you can enjoy all week long in your recipes or as a protein-packed side dish. Using a fine mesh sieve rinse 1 cup of organic quinoa in cold water (Note: the brand pictured here does not require a rinse, but I wanted to show you how to do it if it does. Read the back of the box/bag to find out if rinsing is necessary). 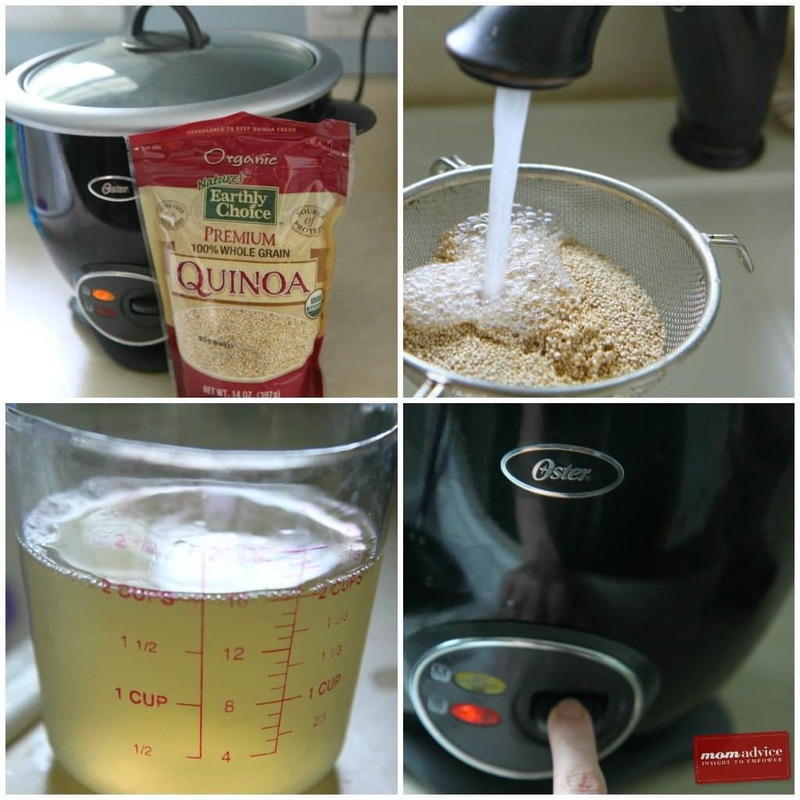 Pour rinsed quinoa into your rice cooker. Add your liquid and salt. Here are a few other recipes I think you will love on our site! Have you cooked with quinoa before? What is your favorite way to serve this food? Any tips or tricks for cooking it? I’m all ears! Disclosure: The link to the rice cooker is an affiliate link and is provided so you can locate what you need quickly and easily.